“Corrugated steel bridges: an opportunity for Chilean connectivity” was the name of the seminar held by Tecnovial and the Ministry of Public Works on 8 May which involved 26 engineers from MOP mainly from the Department of Bridges, Head of Project Structures Gustavo Silva, engineers from the most important engineering offices nationwide, plus Tecnovial commercial staff, and board members of the company Alvaro Alzola and Carlos Gatica, as well as its General Manager Horacio Pinochet. 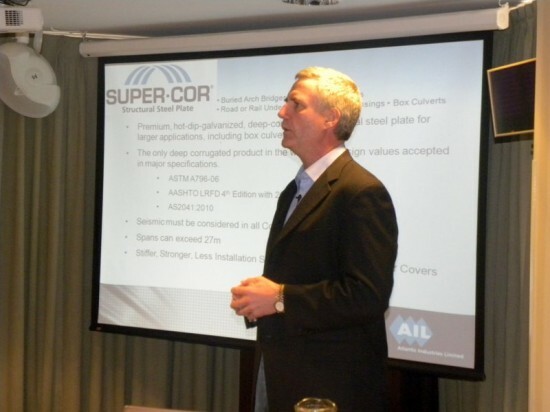 The aim of the meeting held at the Hotel Plaza San Francisco was to deepen on the connectivity remaining challenges in Chile and how the corrugated steel modular bridges can contribute to solve the most important problems in construction of bridges in remote places. On this basis, the advantages of corrugated steel bridges, their structural, installation and costs benefits, among others were discussed during the presentations. It was showed the national and international experience that exists today concerning the matter and its potential as a solution for bridges in Chile. The meeting was attended by Mr. Stephen MacKinnon, Vice President of International Operations of AIL and leader in the field, as one of its standing speakers.